In this hectic world where work schedule dictates our lifestyle and daily routines, the Snow Park in Goa is like a cool breeze that fills you with fresh vibes. Explore this amazing place for couples and create memories of a lifetime. This is one of the best amusement park in goa because of the unique amenities that it offers and perhaps that is the reason for which it has been the amazing places one must go in Goa. This ideal place for the adventurous is waiting to be explored. Not all who wander are lost and especially when one is with their beloved they deserve to get the best. This is exactly what the snow park in Goa, continuously rated as the favourite amusement parks, has brought for you. This amazing place is definitely something that everyone must explore with the love of their life. • The world class amenities that make it the best and one of the much coveted place for couples. • The thrilling rides and the other amusing features that are new, innovative and come at an exchange of a reasonable price. • The yummiest, lip smacking, dishes at the food court is something that one must relish with their loved ones in here that is undoubtedly one of the best things in Goa, which is also a real paradise for couples. • The strategic location is yet another significant reason for which this is one of unique fun points that awaits your arrival. • The cordial service of the inhouse staff of an amusement park like this snow park is something that goes amiss in other similar places. Perhaps that is why the newly opened snow park is flooded with accolades and is rated as one of the top 10 places in goa, and also an amazing place for the couples. • The amusing joyrides that are worth every penny and every second that are not just a mere passing of time but making the best of memories at one this amazing park in Goa. • This is a perfect place for the much-needed photoshoot to show your love on social media and make an album of priceless memories with your significant other and even with your family and kids. This is perhaps the unique selling point, being kid friendly and for couples at the same time. 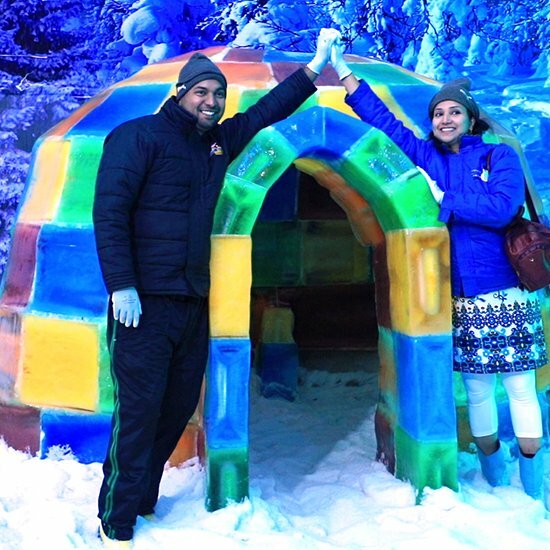 • A day spent at this amazing snow park which is one of the to-do things in Goa is something that you need in real, to strengthen your bond and nurture your love for your close ones. • Of course, this is the best place to beat the heat, the amazing cool environment, at this wonderful place for all. So, do not waste your anymore time. Come and explore this top-rated and loved place which is oh-so-good. Think of Vacation, Think of Goa !